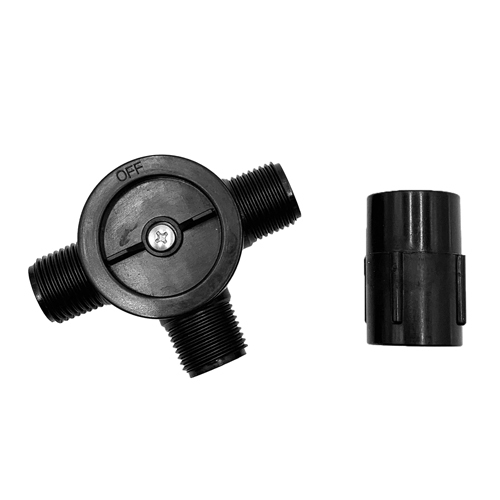 This sturdy 3-way valve can be used on most popular pond pumps. Use it to regulate water delivery from the pump source to waterfalls and streams. Supreme Aquabelle or other fountain heads, UV and other filter systems, and statuary. Controls: "Off", one "On", both "On" PLUS adjustable flow to each outlet. Attach coupling to threaded male pump source. Attach valve to other end of coupling. For use with fountain heads, it is best to connect as illustrated. Regulate flow allocation and volume using knob on valve.